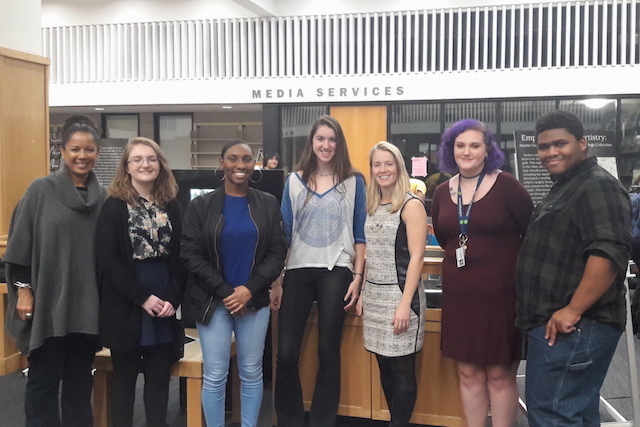 In their first semester of college, students in a tutorial had the remarkable experience of curating a debut exhibition of African artifacts from Hampshire’s special collections and authoring its catalogue. The presentation of centuries-old Asante goldweights, never studied or displayed since their donation to the College in 1984, was the students’ final project in the fall course, Art/Artifact: African Art and Material Culture. In Professor Rachel Engmann’s tutorial course, the students learned the ways African objects have been collected, interpreted, and displayed, on and beyond the African continent. The course covers many aspects of African cultural heritage – history, economics, identity, politics, and ethics.Together they explored a range of questions: How did African objects arrive in 19th-century European museums? What is the relationship between African material culture and colonialism? Who “owns” African art? How do we work with African artifacts today, given international codes and conventions, while respecting local, communal, and indigenous rights? For their exhibition, the students chose to display about a third of the artifacts from the College’s collection of roughly 100 Asante goldweights, crafted centuries ago in Asante, in Ghana. What was most rewarding about presenting the exhibition, says Keelin Matthews, was “learning by doing.” Instead of just reading about art or how to create an exhibit, she says, “we actually did one, which is kind of crazy because it doesn’t seem like something a first-year college student would be able to do. This was great.” One of Matthews’s contributions was researching and writing the catalogue’s essay on the meanings of the goldweight designs. Kate Godil-Freeman says that as a first-year student, it would have been easier just to write a research paper, something you can do at any college. “The fact that we had these weights and got to make these important choices and put on a public exhibit — that was really, really helpful in understanding how to work with the greater community and access resources.” Part of her role was to conduct historical research and write the catalogue’s essay on the many uses of the goldweights beyond being tools for measurement. Making the exhibit even more memorable, the students were mentored by two experts in African archaeology, art, and critical heritage studies: Their professor, Rachel Ama Asaa Engmann, an Africanist archaeologist and assistant professor of African studies, who is half Ghanaian and half English; and Amy Shannon Halliday, director of the Hampshire College Art Gallery and South African scholar of contemporary South African art and photography. At Hampshire since 2013, Engmann strongly believes in encouraging students to get hands-on experience — a model the College was founded on — calling it an invaluable learning component. The seven students enrolled in the course collaborated on the exhibition, titled The Mudfish Grows Fat to the Benefit of the Crocodile: Empire, Orality & Artistry. 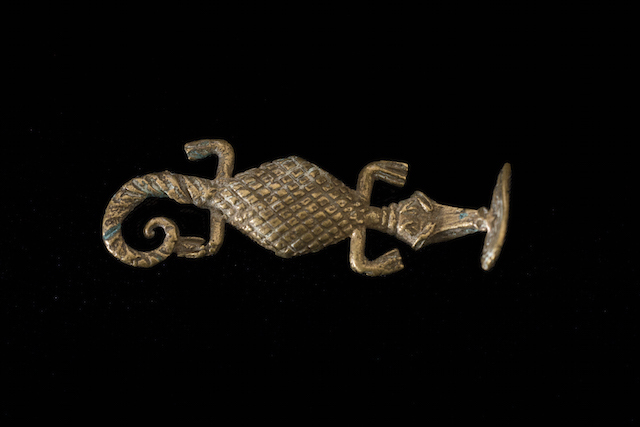 Asante Goldweights in the Hampshire College Collection. In addition to Matthews and Godil-Freeman were Nathan Benjamin, Nichole Greene, Jacqueline Moore, Morgan Martin, and Maxwell Johnson. Their curation was advised by Engmann, Halliday, and Rachel Beckwith, arts librarian. The students write in their exhibit catalogue that the goldweights are brass tools for measuring gold dust on scales. 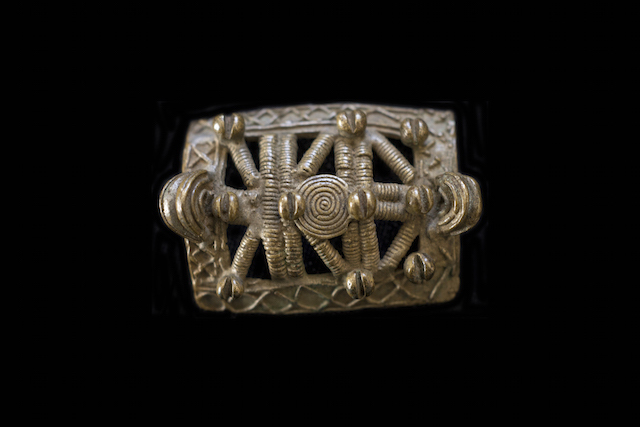 In Asante, weights were employed from the ninth to 18th centuries, when gold dust was used as currency. Engmann explains that the Asante are a Twi-speaking Akan ethnic group, situated between the forest and savanna in today’s south-central Ghana, and renowned for its sophisticated political, commercial, socio-cultural, and religious traditions. The Asante Empire was created at the end of the 17th century with Kumase as its capital. By the 18th century, Asante presided over most of present-day Ghana, including territories beyond its contemporary boundaries. In his catalogue essay, Nathan Benjamin writes that once paper and coin became popular as currency in Asante in the 19th century, brass weights fell out of use as measures. But they continued to be valued as an important piece of Ghana’s history and culture. These objects have significant spiritual and social value to families in Ghana and the region, says Godil-Freeman, as they’ve been passed down for generations, their meanings underappreciated by some Western collectors. The artifacts in Hampshire’s collection were donated to the College three decades ago by Franklin H. Williams, the first African American ambassador to Ghana. His connection to the College and reason for donating the collection is unknown, explains Gallery Director Halliday, who is hoping the exhibition and resulting publicity may prompt someone to come forward with information. The collection consists of primarily geometric and figurative weights, write Jacqueline Moore and Morgan Martin in the catalogue. The geometric weights are shaped like a cube or a pyramid, for example, while the more common figurative weights are designed as a human, an animal, an insect, or a tool. Moore and Martin explain that the weights were molded using one of two methods. Direct casting involved surrounding an object such as a dead beetle with a clay or charcoal mold, incinerating the mold, and filling the void in the center with molten metal. With the more laborious lost wax casting, one or more craftspeople hand-formed a wax mold to be cast in metal by a blacksmith. The figurative goldweights were often designed to represent proverbs passed down by oral tradition, says Matthews. 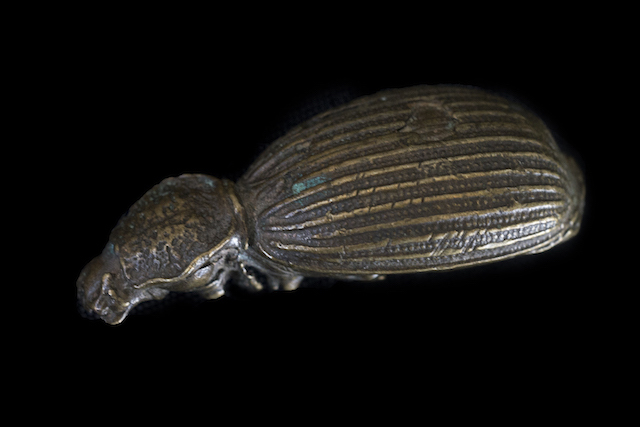 For instance, the beetle is the subject of a popular Ghanaian proverb: Futukokӧnini pë daberë na ӧkӧfa ӧsebӧ yӧnkoӧ. Translation: “The little beetle likes a sleeping place, so that is why he became the leopard’s companion.” Meaning: A weak person goes to a strong one for protection. Ekyëm a emu atwitwa no, yënnwono bio. Translation: “A shield which has been cut to pieces, we do not weave again.” Meaning: You cannot restore a ruined reputation. In the exhibit catalogue, Nathan Benjamin discussed collecting practices during British military expeditions and under British colonialism. Later, collectors, connoisseurs, and dealers continued to acquire goldweights, and still do so to this day. The course and exhibit were an opportunity to examine the many values – social, cultural, historical, technological, and aesthetic – associated with African material culture and art, and to assess the impact of collecting practices on contemporary Africans, says Maxwell Johnson. A number of the students say the immersive work altered their perspectives. Nichole Greene, who enrolled in the course to begin her concentration in curatorial practice, says she appreciated learning historic constructs of how Africa is depicted in Western museums. The goldweights help counter popular misconceptions rooted in colonial ideologies; for example, that African peoples were isolated and that their art was “primitive” and “underdeveloped,” Greene says. 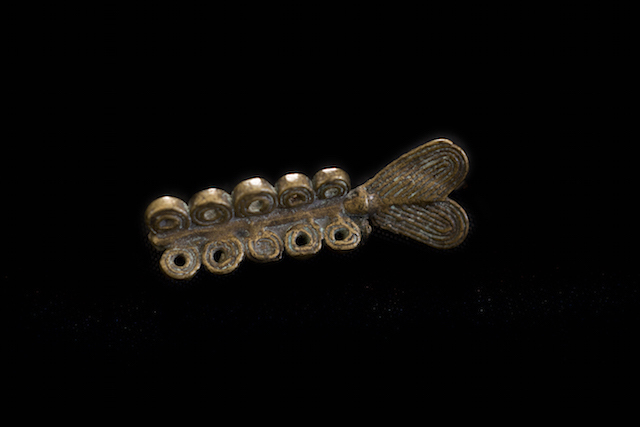 The artifacts show advanced knowledge of metal working, she adds, and reflect the complex economic system of the Asante Empire. 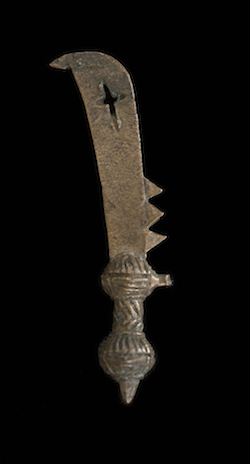 Some artifacts in the collection incorporate European and Islamic designs, providing material evidence for Asante participation in a vast trans-regional and continental network, including people, cultures, and traditions. Keelin Matthews says this experience helped her consider whether cultural objects are displayed respectfully in Western museums. “I find I have a much more critical eye on exhibitions,” she says. The course has inspired some students to continue to explore these topics at Hampshire, notes Engmann. Nichole Greene will now specialize in Africa, archaeology and critical heritage studies. Morgan Martin was particularly interested in working with artifacts, as she plans to concentrate in archaeology. Keelin Matthews also plans to focus her studies on Africa, critical heritage studies, and public history. The work accomplished by these students in their first-semester tutorial also promises to have a lasting impact at the College. Halliday says that by researching and curating the exhibition and catalogue, the students have created knowledge about the collection, even while its donation to the College remains a puzzle. She says the students have documented the collection in a way that promises to further its use for teaching and learning by future students and scholars at Hampshire.